Large Capacity, 20 cu ft.
Great size in a feature-packed refrigerator. Details matter more than ever when creating a distinctive kitchen. Humidity-controlled crispers are a great place to keep fruits, vegetables, and more. Digital Temperature Controls designed to monitor and maintain conditions to help keep food fresh. Click the button below to add the LG - 20.2 Cu. 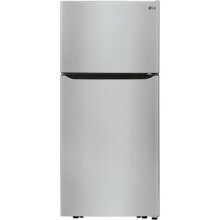 Ft. Top-Freezer Refrigerator - Stainless steel to your wish list.